Well, it's supposed to be but thankfully the forecasters were wrong and today turned out to be an absolute pearler - sunny, clear and still - so it was fantastic to be able to get the Connie out of the shed and give it so long needed exercise. After filling the tank I made my way up to Danniverke to meet up with Sarge and from there we cruised on up the road to meet up with Roberty Dog in Waipuk. Five minutes further up SH2 we turned off to head towards Middle Road. We took a different route (via Racecourse road) than I normally take but it didn't take long until we were onto the fantastic Middle road and on our way towards Havelock North. In Havelock we stopped for a bite of lunch and got to take in the magical music of a Merlin as a Spitfire took a slow lap of the Bay as part of a small airshow in Napier. An unexpected bonus! Leaving Havelock we waved off the R1 and Sarge and I took Kahuranaki road through to Elsthorpe and Patangata. A really nice ride through here although there was still remnants of the loose metal on road that I encountered last time through here. 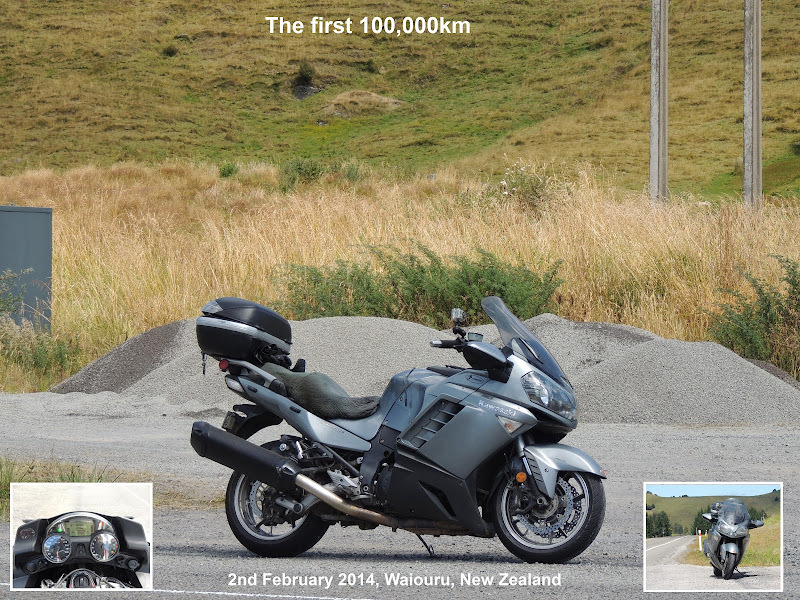 After a quick stop at Patangata to have a look at all the other bikes parked up there we carried onto Waipawa and the Waipuk. South of Waipuk we got off the main road again and rode through to Takapau and Ormonville before popping back onto SH2 at Matamau. Back in Danniverke I said my goodbyes to Sarge and continued on home to complete a fantastic 350km winter's ride. I like my winters like this! Is this a perk of Ducati that comes with ownership? Yep, the bad weather hit last night and we've had rain for most of the day (say 99.9% of the day) so I spent the day in the shed playing with my toys. The first job after having a bit of a tidy up was to change the oil in both bikes and this went well except for a little spill when removing the Honda's filter - it wasn't quite as bad as BP's current woopsie so it was sorted pretty quickly. The job itself was pretty easy although I had a few little issues. One of the old grips had to be cut off and the LHS hot grip was very firm to get on (didn't even bother to glue it on). Routing all the wires was also quite a job as there are wires going from the keypad to a controller under the seat and then back again to the grips. Additionally, trying to keep them out of sight meant poking them in and around all sorts of things and trying to keep them away from hot things at the same time. Yep, we've got a long weekend this weekend but the weather forecast for two of the three days is crap - wet, wet, wet! So after waking up to a fairly frosty but sunny Saturday morning, Brian and I decided to get our weekend ride in before the weather turned to custard. We'd initially planned a decent ride taking in the back roads (some of Route 52) to Martinborough for lunch before returning via Mauriceville and Mangamire. A good squirt and a chance to exercise the Connies. But with the hard frost we wussed out on Route 52 (there would have been a good chance of some frosty bits) and decided on a smaller ride nearer to home and so broke out the Hondas. After petrol in Ashhurst we attacked the Saddle - but with a lot of caution as it was fairly greasy and slippery in places. I also got quite a good fright as I climbed the hill when a Subaru came around a corner on my side of the road and we both had to take evasive action. A good thing that neither of us was travelling quickly but man some people need to learn how to drive! From the Woodville side of the Saddle we followed the hill as we tried to keep away from SH2 but eventually popped back out just South of Oringi. At Oringi we turned off again to take in Jackson Road to Hopelands. It was very nice through here (as always) with nice views of the farmland and a great bit of road. We turned left off Jackson Road and cruised through to Kohinui before popping out onto the main road at Mangatainoka. From here it was just a short ride through to Pahiatua where we stopped for a hot drink and lunch before continuing on over the track to home. It turned out being quite a short ride but it was a lovely winter's day which helped make it another great ride out on the little Honda.